Mobster John Gotti Jr., who escaped prison after mistrials were declared in four straight trials in New York, is off to make some doe the legitimate way. The website Deadline Hollywood reports that the Dapper Don Jr., the former chief of the Gambino crime family, wants to peddle his life story in a documentary film, a feature film and a book. The website said his story will be about what it was like to grow up with a famous mobster dad. The website said Gotti is working with Triplicity Entertainment, a New York-based production company whose founders include attorney Tony D’Aiuto, one of the attorney’s who represented Gotti in his last trial. 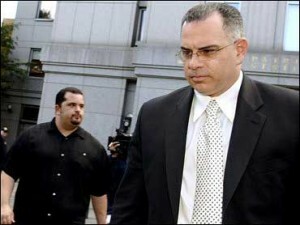 The U.S. Attorney’s Office announced in January that it would not go after Gotti in a fifth trial. Jurors in the previous four trials deadlocked and mistrials were declared. Gotti had been charged with racketeering and having a hand in murder. “He’s willing to go all the way, revealing as much as possible without hurting anyone who’s still involved in the street life,” attorney D’Aiuto told Deadline Hollywood. Posted: 4/5/10 at 8:09 AM under News Story.